What better way to relax at the end a busy day at the office than to sit in a comfortable chair by the fire in your family room or den? 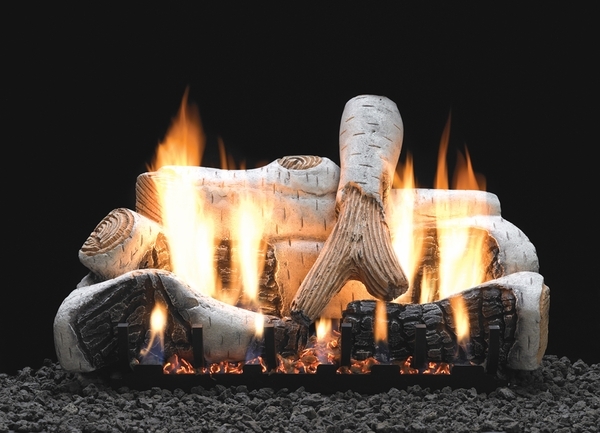 The vent-free burners of this beautiful ceramic fiber gas log set take care of fumes and harmful gases. All you need is a remote control. Enjoy a "wood" burning fireplace without the hassle of chopping, stashing, and carrying in armfuls of logs. Made in the US, the realistic flames of this set, provided by either propane or natural gas, create a relaxing and warming atmosphere in your home. Four sizes are available and emit up to 38,000 BTU of heat. Bought this log set to add some character to our living ton. Works nice the top log looks a little fake but overall pretty good.